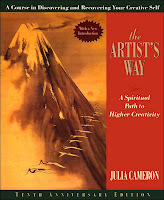 A few years back, I was introduced to a book written by Julia Cameron called The Artist's Way. Apparently, she lost her writing mojo for several years, but got it back after a lifestyle change. She attributes a lot of her success to having quit drinking and setting aside the purist, 'starving artist' mentality. As much as I joke about wine being my creative juice, it is impossible to write constructively after any libation. Perhaps, after a glass or two of vino there might be a fleeting burst of inspiration- but it's a very small window of time lasting just a sip or two. In a nutshell, The Artist's Way is about discovering (or recovering) your creative self, which we all need from time to time. It was well written, but a little too spiritual for my taste. I kind of lost steam about half way through the book, but the two primary creative exercises stuck with me. One was called the Artist's Date, which is a weekly exploration of something- anything- that interests you. The exercise can take 5 minutes or 5 hours. Bottom line is to learn about something once a week, because who knows how or when new inspiration will strike. This has certainly led to personal discoveries of new foods, websites, authors, and to a few lovely new experiences- although none which I have written about. Not yet, at least. The second exercise is called Morning Pages. Write 3 pages a day (in her world, it should be in the morning) about anything off the top of your head. Profundity is not important. They are to hone your writing skills and thought processes. Writing drills. The more you do it, the more comfortable (and possibly better) you become at it. It dawned on me today that this blog serves as my morning pages. It's been a long time since I've literally put pen to paper, so the idea of "writing" 3 pages a day seems like a drag. But given I am already a slave to my laptop and perpetually online, blogging seems a practical and appealing way of fine tuning the writing skills and maybe breathing new life into my creative mojo.